The Spa at Sanur Paradise Plaza Hotel offers traditional massage, beauty and healing treatments administered with nurturing mindfulness by gifted hands. The exotic facial, body and massage treatments are based on the ancient beauty, healing and rejuvenation secrets of various Asian cultures, with Balinese traditions featuring prominently. It is about the total sensory experience – beauty and refinement in all that is seen, heard, touched, smelled and tasted. It is about attention to detail, caring and graceful service, exquisite products, and a relaxed environment. They are presented with nurturing mindfulness, by gifted hands. Featuring 8 treatment rooms and decorated in Balinese style to reflect the flavour of the treatment range, The Spa also houses a hair salon complete with a manicure and pedicure salon. The exotic facial, body and massage treatments are based on the ancient beauty, healing and rejuvenation secrets of various Asian cultures, with Balinese traditions featuring prominently. It is about the total sensory experience – beauty and refinement in all that is seen, heard, touched, smelled and tasted. It is about attention to detail, caring and graceful service, exquisite products, and a relaxed environment. Rejuvenate your body with Bali’s own traditional massage – handed down through generations for healing and strengthening the body and mind. This traditional therapeutic massage greatly improves blood circulation, reduces tension and stress, relieves sore muscles and leave your body heavenly refreshed. Sweet Swedish Sensation!. A harmonized synergy based on the Chinese, Egyptian, Greek, and Roman techniques. It’s popularly practiced at Spa around Europe. Involving even steps of stroking, kneading and pressing the soft tissue on the entire body. It induces immense relaxation. Feel free to choose our selection of aromatherapy essential oils to suit your personal preferences. Reenergize your body with this authentic Western therapeutic massage. Comforts tight muscles and calms tension, especially around the upper back, neck and shoulder areas. It includes the dynamics of acupressure and deep tissue elbow massage. Especially suitable for sport lovers who enjoy regular sport, works out in the gym, or anyone who has specific muscular tension. Invigorate your spirit with the oriental classic pressure-point massage and gentle muscle stretching. A path-way of physical therapy involves deep pressure on acupuncture points as well as stimulating the balance of body energy and good health. Uniquely adopts the technique of firm finger, palm and elbow pressures that perform through clothes or a towel without the use of oil. This treatment is a wonder to relieve tension, headache, back ache and will promote energy flow in the body. The Reflexology is based on the principle that there are reflex points located on the feet and hands which correspond to each organ, gland and structure in the body. Using a harmony thumb and finger acupressure, this therapeutic massage relieves tension all over the body, improves blood supply and unblocks the functioning of nerve impulses. Special designed treatment to treat your feet after working all day or after long walking during your tour. Starts with foot ritual, foot scrub and mask, shoulder massage while waiting the mask dry, then finished with foot massage to promote blood circulation and refresh your feet. Treat your Nail and cuticle. No nail polish after the treatment would be better to maintain nail’s health. Be a King and a Queen for a day! Together, find you and your loved one to slip into a luscious head to toe indulgence spa treatment. It’s a perfect way to celebrate your special day with your loved ones. The Exotic of Rice Extract and Essential oil functioned as natural aphrodisiac. With Rose, Sandalwood, Jasmine and Cananga Oil to relieves nervous tension and renew the spirits. Moistened, softened and smoothened the skin. It is an ancient recipe of love and believed to be amorously stimulating. Includes; sea salt Foot bath, aromatherapy rose and sandalwood oil massage, scrub, mask, rose petal bath. Please register to review the spa. 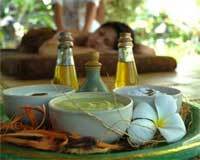 Rejuvenate your body with Bali's own traditional massage, handed down through generations for healing and strengthening the body and mind. This traditional therapeutic massage greatly improves blood circulation, reduces tension and stress, relieves sore muscles and leave your body heavenly refreshed. Sweet Swedish Sensation! A harmonised synergy based on Chinese, Egyptian, Greek, and Roman techniques, and practiced at spas around Europe. Involving even steps of stroking, kneading and pressing the soft tissue on the entire body. It induces immense relaxation. Feel free to choose our selection of aromatherapy essential oils to suit your personal preferences. Reenergise your body with this authentic Western therapeutic massage, which comforts tight muscles and calms tension, especially around the upper back, neck and shoulder areas. It also includes the dynamics of acupressure and deep tissue elbow massage, and is especially suitable for sport lovers who enjoy regular sports and workouts in the gym, or anyone who has specific muscular tension. Invigorate your spirit with the oriental classic pressure-point massage and gentle muscle stretching. A path-way of physical therapy involves deep pressure on acupuncture points as well as stimulating the balance of body energy and good health. Uniquely adopts the technique of firm finger, palm and elbow pressures that perform through clothes or a towel without the use of oil. This treatment is a wonder to relieve tension, headaches, and back ache, and will promote energy flow in the body.